If you’re reading this, you know that I love the medium of comics. I love it like Greece loves a bailout. And like many fans of the medium, I’ve wanted to write my own comics for about as long as I can remember. And now, I have. Enter the Condo Of Mystery!. It’s a website dedicated to the free (!!!!) webcomics created by myself, Jay Cormier, and Rob Lundy. Unlike most webcomic sites, which focus on one specific storyline, we will be exploring many. We will be doing short stories, as well as longer multiple chapter comics. The cover to our first comic is up now. 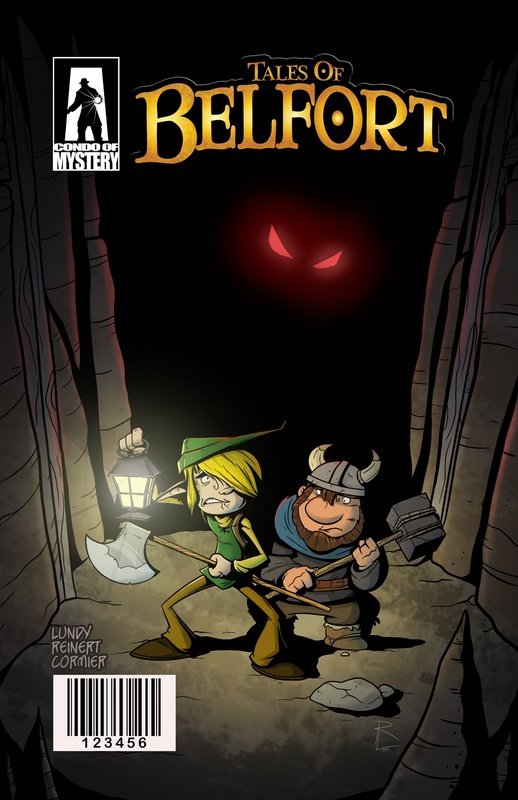 It’s called Tales Of Belfort, and it’s a kid-friendly all-ages fantasy short story based on the hit board game designed by Jay and his partner Sen.
To say that this is a dream come true for me would be an understatement. And it’s just the beginning. We’ve got all sorts of great stories planned, in as many genres as you can think of. So please add us to your RSS feeds, and share the link if you’re so inclined. This entry was posted in Comic Books and tagged Comics, Condo Of Mystery. Bookmark the permalink.